Pioneers in the industry, we offer imidazole and zinc borate from India. It is a white or colourless solid that is soluble in water, producing a mildly alkaline solution. In chemistry, it is an aromatic heterocycle, classified as a diazole, and having non-adjacent nitrogen atoms. Many natural products, especially alkaloids, contain the imidazole ring. This ring system is present in important biological building blocks, such as histidine and the related hormone histamine. Many drugs contain an imidazole ring, such as certain antifungal drugs, the nitroimidazole series of antibiotics, and the sedative midazolam. Zinc borate is primarily used as a flame retardant in plastics and cellulose fibers, paper, rubbers and textiles. 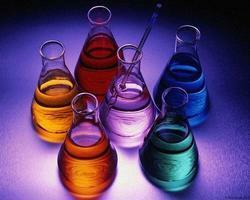 It is also used in paints, adhesives, and pigments. As a flame retardant, it can replace antimony(III) oxide as a synergist in both halogen-based and halogen-free systems.